The pine marten (Martes martes) is considered one of the rarest and most elusive wildlife species in Ireland. Once common throughout the country, by the 20th century the species had become extinct from the majority of Ireland, surviving only in a few isolated and fragmented populations mainly in the west. The main reasons for the species’ decline were related to hunting for its fur; loss of habitat through the destruction of forests; direct and indirect poisoning and persecution as a potential predator of livestock/game populations. Taxonomically, the species belongs to the Mustelid group of animals and it is related to wildlife such as the stoat, otter and badger. Adult pine marten are about the size of a domestic cat, hence the Irish name ‘Cat crainn‘, and have a long tail that can be half the length of their body. They have a rich fur coat, typically dark brown in colour and a distinguishing creamy-yellow throat patch. Pine marten are habitat specialists, requiring forest or scrub habitat to exist in an area. They are adept at climbing trees as they have powerful non-retractable claws. The species is primarily active at night and individuals live in territories that can vary in size from 60 hectares to 430 hectares. Males typically have bigger territories than females and there can be partial overlap between adjacent territories. Life expectancy can be up to ten years, although the majority of individuals are unlikely to survive past five years in the wild. Pine marten occur throughout mainland Europe, stretching from the Ural mountains in the east to Ireland at the western edge of the species global distribution. They can also be found in parts of the Middle East. In Europe, pine marten exist with a similar species called the beech or stone marten, although that species tends to be more associated with areas of human habitation. Also, in the eastern parts of pine marten distribution (mainly Russia) there is some overlap with a related marten species known as the sable. In Ireland, pine marten were once widely distributed throughout every county. 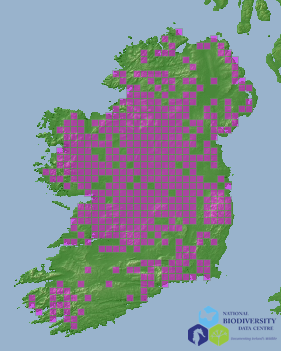 Current pine marten distribution is largely concentrated in western counties and the midlands of Ireland. The species now occurs in approximately 50% of its historical range. Pine marten remain extinct throughout the majority of Munster and are very rare in Ulster. Pine marten can utilise a variety of den sites, which are used for breeding. Den sites can include rock crevices, tree cavities, subterranean burrows, buildings (abandoned or occupied), old bird nests, squirrel dreys and log piles. These sites provide cover from weather extremes and safety from potential predators. Den sites are normally only occupied during the breeding season. Outside of this period, pine marten use what are termed refuge sites. Refuge sites can be very varied although normally they are located several metres off the ground in forest canopy. Upturned or blown over tress are often used as refuge sites but the species can exploit any habitat feature that provides cover and safety. Pine marten will tend to have refuge and den sites that are used repeatedly in a forest and they can have a high fidelity to these sites. Pine marten are solitary and adults avoid contact with each other throughout most of the year. The species only breeds once with mating typically occurring in early summer between adults that are at least two years old. Pine marten have what is termed ‘delayed implantation’, which means that fertilised eggs are not implanted in the uterus until the following January. This is a strategy to ensure that young (known as kits) are born during the most favourable time of year, which for pine marten is during March and April. Typically, two to three kits will be born in spring, each weighing less than 30g. The kits will stay in the den for about six weeks and are totally dependent on the female. Kits will then start exploring the area around the den and will stay with the female for at least six months, up to a maximum of 12–16 months. After this period, juveniles will disperse and attempt to establish their own territory. Only a small number of juveniles will survive to become adults and breed. Pine marten are considered to be slow breeders both in the terms of the number of young that are produced and the age at which reproductive maturity is reached. In terms of diet, pine marten are omnivorous taking both plant and animal material. In Ireland, pine marten exploit a variety of resources including berries, fruits, small mammals, invertebrates, birds and amphibians. In some areas where pine marten occur close to towns and villages the species will exploit rubbish bins for food. In other countries, pine martens rely heavily on microtine rodents such as voles and also in colder countries on carrion, especially in winter. When foraging, pine marten will usually stay within their own territory, which will have a variety of food resources available within it. Due to historical declines in the distribution and abundance of pine marten in Ireland, the species was protected under the Wildlife Act 1976. Since that legislation, pine marten have also been included in Annex V of the EU Habitats Directive 1992, Appendix III of the Bern Convention 1979 and the Wildlife (Amendment) Act 2000. Despite the protected status of the species relatively little is known about the ecology or abundance of pine marten in Ireland. However, in 2005 a research project called the National Pine Marten Survey of Ireland (led by Ecological Management Group) was initiated, which has provided data on the species distribution, ecology and abundance. In the last 30 years, the distribution of pine marten in Ireland may have increased which could have been influenced by increased afforestation, less persecution and some deliberate re-introductions of pine marten into areas where the species had become extinct. Despite this recent increase, pine marten currently only occur in approximately half of their historical distribution range. Recent abundance estimates suggest that the total population of pine marten in Ireland is approximately 2,700 individuals, making it Ireland’s rarest native mammal species. There are number of factors that can impact on pine marten populations including land use planning, forest management practices such as harvesting, habitat fragmentation, inbreeding, illegal persecution either through generic poisoning or deliberate killing and destruction of forest/scrub habitat for development. Pine marten are susceptible to habitat loss and human persecution in Ireland, and due to their low population size and slow breeding performance should be seen as vulnerable for the foreseeable future. Dr Declan O’Mahony is a wildlife ecologist and has been conducting research on mammals for over 12 years. He has been working with pine marten in Ireland for the last seven years conducting basic and applied research on this important species. His interest in pine marten was influenced by the general lack of knowledge and data on the species’ ecology and conservation status in Ireland, despite its protected status. Currently, he is most interested in undertaking further research on pine marten ecology and developing conservation management strategies for the species with key stakeholders (i.e. forest companies) that minimise any impacts of forest management. Some references are included below. O’ Mahony, D. (2009) Socio-spatial ecology and habitat selection of pine marten (Martes martes) in upland coniferous plantations, Ireland. Report to Department of Agriculture Fisheries Food and Peoples Trust for Endangered Species. Diet:Berries, fruits, small mammals, invertebrates, birds and amphibians. Habitat:Requires forest or scrub habitat that provides cover.